I’ve often mentioned at this blog my love for Lord of the Rings (LoTR). While I’m admittedly not nearly as well steeped as Tolkien superfan Stephen Colbert in all things Hobbity, I’ve still got pretty good bonafides. Tolkien’s work hit the mainstream in the U.S. in the 1970s when I was in junior high school, a perfect age to discover the books. One of my prized possessions is a boxed edition of the Hobbit and the trillogy that I received as a Christmas present in the early ‘70s, which I have read in their entirety numerous times. I have an early edition of his “prequel” work, the Silmarillion, and excitedly watched the Rankin-Bass adaptations of the Hobbit (and, later, the Return of the King) when they first aired on TV, as well as Ralph Bakshi’s ill-fated animated film adaptation of the first half of the trilogy when the film debuted in theaters. So, of course, like all LoTR fans, I was thrilled by Peter Jackson’s epic film adaptation of the trilogy. Co-scripted by Jackson with screenwriting partners Fran Walsh and Philippa Boyens, Jackson’s film faithfully interpreted the spirit and poetry of Tolkien’s masterwork. Tolkien was able to create a rich and believable Middle Earth because, as a linguist, he understood that language, culture and history were intertwined—details that Jackson and his design team incorporated into their work to breathe life into the movies. While I don’t doubt Jackson’s sincerity in tackling the Hobbit, the prequel trilogy nevertheless has felt a bit more calculated and less spontaneous than the original LoTR trilogy. Warner Brothers, understandably, was anxious to continue the franchise and no doubt thrilled by Jackson’s request to turn what is essentially a children’s story of dwarves, magical rings and goblins into a full-fledged Middle Earth epic. Jackson now likely had all the means and resources at his disposal, and more freedom, to do the films as he saw fit. With that said, I have to admit I was left a bit cold by the first two Hobbit films. While I certainly felt they were well done I felt that Jackson’s desire to surpass the early trilogy with even greater spectacle and special effects turned it more into a roller coaster ride and somewhat overwhelmed the original story and its characters. 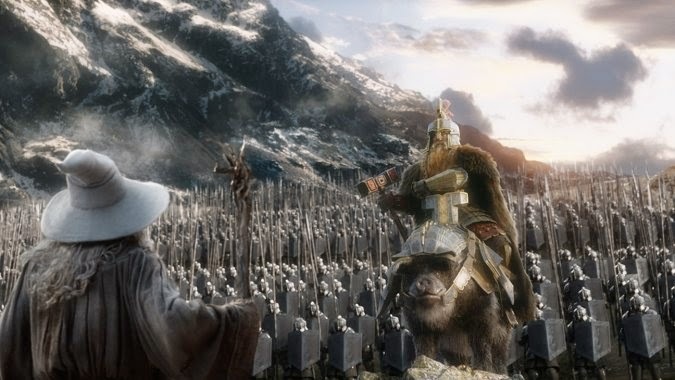 With the set up of the first two films now out of the way, the Hobbit: The Battle of the Five Armies rushes headlong into an extended climax to the story. Unlike the other films dating back to the original LoTR trillogy where Jackson took time to use the opening sequence to ease the audience back into the story, the story picks up at full tilt from where the Hobbit: The Desolation of Smaug left off, with the re-awakened dragon, Smaug, on his way to wreak havoc on Laketown. 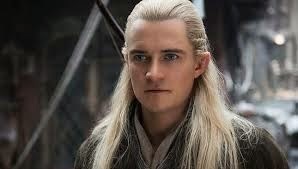 People not familiar with the book may be surprised at how quickly Smaug is dispatched, leading to the real climactic conflict of the Hobbit, as the humans of Laketown and the elves of the Woodland Realm seek redress and recompense from the dwarves who provoked the dragon. Thorin, beginning to show the same obsession for treasure that drove his father and grandfather to madness, refuses to be extorted. 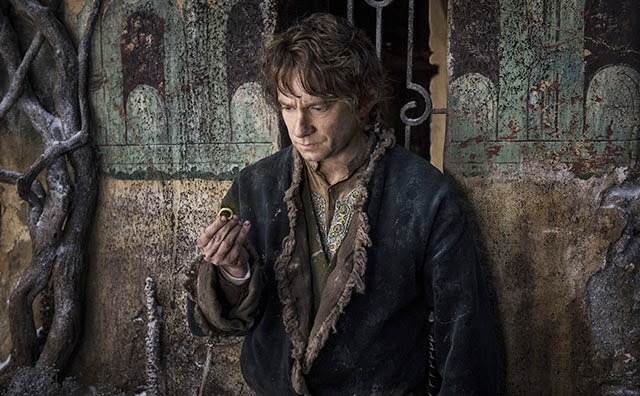 Bilbo, while loyal to Thorin, nevertheless tries to broker peace by turning over to Thorin’s besiegers the one item he values over all else: a rare jewel called the Arkenstone, the heart of the dwarven kingdom under the mountain. As Thorin prepares to go to battle, however, all the armies of the free peoples soon find themselves attacked by armies of goblins and orcs, led by Azog the Defiler. Although the last installment is action-packed, for me, the trilogy ended on a positive, strong note. The time Jackson spent at the beginning of the film (following the Smaug sequence) and in the previous films to develop the characters finally pay off. The resolution to the Tauriel/Kili romance ends on a moving note and the battle scene near the beginning of the film between Galadriel, Elrond, Sauron, and Gandalf against Sauron is a particular treat. Thorin’s final battle with Azog is perhaps a bit too drawn out and represents one of Jackson’s most extensive digressions from the original book, but like the extended closing sequence of the earlier trilogy, Jackson has earned the right to end the series on his own terms. My only complaint is that I wish the film spent a little time showing the surviving dwarves make peace with the people of Laketown and the elves at the end. Aside from that, the final film was a satisfying end to the sprawling telling of the original Hobbit novel and becomes a fitting “prequel” to the Lord of the Rings trilogy that follows chronologically.